If you’ve been in the electronics industry for any time at all, you have heard about counterfeit components. In a recent government study, 39% of OEMs say they have been directly impacted by this problem. This is a serious matter and learning how to avoid becoming victim to this brand-damaging issue is an absolute necessity for Original Equipment Manufacturers (OEMs). Whether you build your own products or use a Contract Manufacturer (CM), it’s critical to ensure safe guards are in place to protect your build quality and reputation. A simple definition would be “an electronic component that is misrepresented by any source in the supply chain process.” This can include misrepresentation by the manufacturer, supplier, distributor, contract manufacture or any other supply source. The government definition of a counterfeit part, as defined by the Department of Defense (DOD), discuses counterfeit parts at length and can be a useful resource. In most scenarios, unauthorized or counterfeit parts come from reclaimed or scrapped parts that are refinished in some way and represented as new, but there are many scenarios in which a company can create counterfeit components. A counterfeit part can also be created by relabeling, refurbishing, or repacking a part that has gone End-of-Life (EOL), obsolete, did not pass Quality Control (QC) inspections, or were faulty in some way to begin with. This chart accurately represents the multitude of sources a counterfeit part can come from. Anyone who purchases parts from a selling source is capable of falling prey to the practice of counterfeiting. Whether you are a buyer for a CM or an OEM, you can be misled into purchasing a counterfeit product if you’re not careful. The level of sophistication in counterfeiting continues to improve and is therefore getting more difficult to identify. 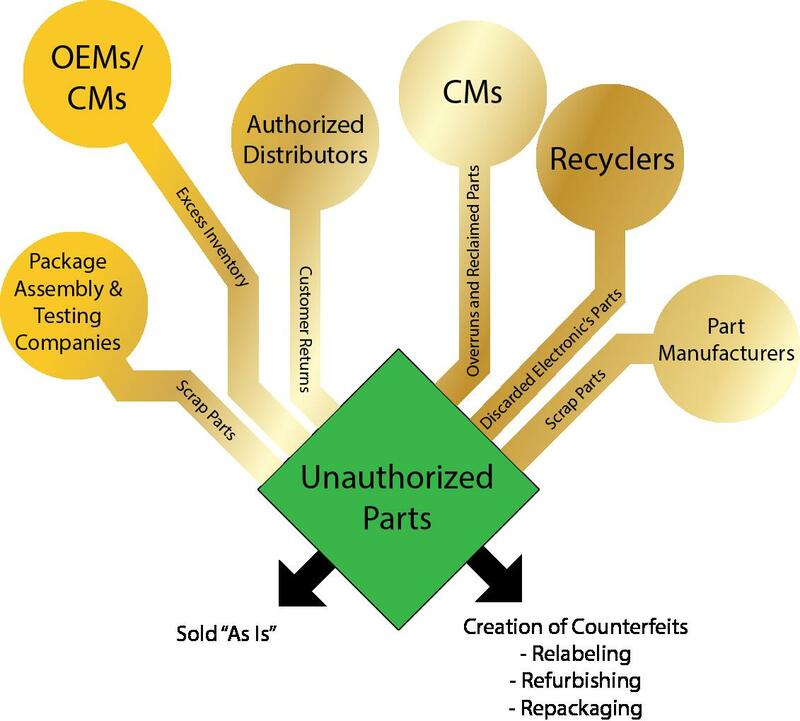 In 2011 alone, the Government Accountability Office (GAO) reported that 40% of the supply chain is tainted with counterfeit parts. The two easiest, and perhaps most obvious, ways to avoid purchasing counterfeit parts are to purchase parts directly from the source or from a distributor franchised with that source. However, sometimes you need to work with new suppliers when sourcing materials due to availability or timelines. When this happens, you need to be on the lookout for counterfeit parts. The first step in identifying a counterfeit part is through trace ability. Recent changes in regulations require most parts to be able to be traced back to their origin, so your supplier should be able to provide the proper tracking documentation. Be sure to review the documents and look for any strange occurrences. Things like random font changes and layout changes can be red flags that the documents have been forged or altered. Visual inspection is commonly used to identify suspect parts. The downside to this however, is the sheer amount of knowledge needed to do this properly. At first glance, almost all counterfeit components will deceive someone who is not trained to look for specific issues. Internal inspection, known as decapsulation, is an excellent way to verify a component. However most end users lack the proper equipment to inspect the internal elements. Instead, X-Ray technology allows you to see inside the component effectively and identify the dies, workmanship, and proper internal structure. Compare a suspect counterfeit to legitimate components and the differences should be noticeable. As you know, counterfeit parts are an extremely complex issue that will not likely be solved any time soon, if ever. The fact remains that over 39% of manufacturers were affected by counterfeit parts between 2006 and 2010, and that number has since grown. With proper awareness, oversight, and choosing the right supply and manufacturing partners, you can minimize your risk.